The emerging economies of Brazil, India, China and Russia will enjoy an agricultural boom over the next decade as production stalls in Western Europe, a report says. Agricultural output in the Bric nations will grow three times as fast as in the major developed countries, the joint United Nations-OECD study said. Livestock and crop prices will stay above long-term averages, it added. And rising incomes and urbanisation in developing states will drive growth. "Developing countries will provide the main source of growth for world agricultural production, consumption and trade," the report said. "As incomes rise, diets are expected to slowly diversify away from staple foods towards increased meats and processed foods that will favour livestock and dairy products. "For virtually all commodities, the projected growth in imports and exports of developing economies [over the next decade] exceeds that of the OECD area," said the report. A further increase in oil prices could... reinforce feed stock demand for biofuels. While overall world net production of commodities is forecast to grow 22%, production among the 30 members of the OECD is estimated at 10%. Production in western Europe alone will stagnate. This OECD growth rate is almost three times slower than the growth rate of Bric countries, which is forecast to expand 27%. The report also identifies Ukraine as likely to see rapid agricultural growth over the next few years. 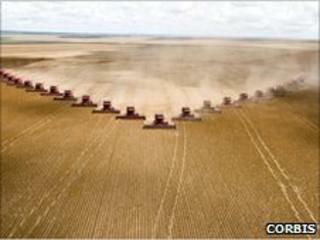 Crop prices, in real terms, will rise between 16% to 40% "above their average for the decade". And average dairy prices are expected to be 16% to 45% higher, with butter prices showing most gains. Brazil is forecast to see by far the fastest growth in agriculture, with a expansion of more than 40% through to 2019. China and India are expected to see growth of 26% and 21% respectively to 2019. Projections for Russia and Ukraine were 26% and 29%. Food prices in 2007-08 soared, sparking protests and riots, as demand for biofuels diverted commodities into energy production. The UN-OECD's annual Agricultural Outlook said it did not expect to see a similar food price shock in the coming years. However, the report warned that a sharp rise in energy prices could again impact on the food industry. "A further increase in oil prices could be expected to increase input and production costs, having an impact on crop supplies, prices and trade flows, and reinforce feedstock demand for biofuels." Looking beyond the next decade, the report forecasts global food production to expand by 70% by 2050.